Background Information. Captured data about organizational/agency characteristics such as type, size, and health priorities of organization/agency, as well as the job title of the respondent. Uses of Healthy People 2010. Captured data about whether the organization/agency uses Healthy People 2010, how it uses the initiative, and factors that enable or hinder its use within the organization/agency. Uses of Healthy People 2020. Captured data—from respondents who report their organization/agency does use Healthy People 2010—about organization/agencies’ anticipated uses of Healthy People 2020, and desired format of Healthy People 2020. Non-Users of Healthy People 2010. Captured data from respondents who report their organization/agency does not use Healthy People 2010 on why it does not use the initiative, barriers to use, and ascertains general perceptions about the initiative. The format described above allowed for the collection of essential demographic information on all respondents, regardless of their use of Healthy People. By asking respondents about their current uses of Healthy People 2010 before asking about their anticipated uses of Healthy People 2020, the questionnaire enabled respondents to fully consider the activities and uses they were most familiar with, and then identify how Healthy People can be improved. This survey design was developed by reviewing and revising the questionnaire from the 2005 User Assessment. In addition to reviewing the key findings of the 2005 User Assessment, input was also gathered to include questions measuring the impact of HHS-sponsored activities that have taken place over the past three years, as well as planning activities that are currently underway to prepare the next decade’s set of national objectives for health promotion and disease prevention. Since the 2008 User Study did not address HealthierUS, there was an opportunity to develop a questionnaire that included more detailed questions on some other issues pertaining to Healthy People 2010, while still minimizing respondent burden. Key research questions that framed the data collection strategy for the 2008 User Study can be found in Exhibit 1. After completing the survey data collection, 10 informal discussions were conducted with users and non-users of Healthy People 2010, from each of the respondent groups. These discussions lasted between fifteen and thirty minutes and provide qualitative information on utilization of Healthy People 2010, and ways the next iteration could be improved. A pretest of the survey instrument was conducted to ensure the questions and available responses were clear to respondents and that the questions captured the intended information. The study questionnaire was mailed to three former employees of tribal health organizations and four former state Chronic Disease Directors. Pre-testing participants were identified by the National Indian Health Board (NIHB) and The National Association of Chronic Disease Directors, ensuring the questionnaire was tested by people similar to those in the survey sample. These participants completed the questionnaire on their own, and then participated in a modified cognitive interview with NORC staff; reviewing the structure and context of the questionnaire and providing feedback on their understanding and perceptions of the survey. Findings from the pretest were incorporated into the final study questionnaire. The study received clearance from the Office of Management and Budget (OMB Clearance Number 0990-0329). The final questionnaire is included as Appendix 1. The participant list for the 2008 User Study was constructed from multiple sources, with separate sampling frames for state, local, and tribal health organizations/agencies. The state level sample sought responses from two groups within each state’s Department of Health: the Healthy People State Coordinator (HP Coordinator) and the Chronic Disease Director. HP Coordinators were included because they are directly involved in Healthy People and are a primary audience and proprietor of the initiative. 1. What are the organization/agency characteristics of users and non-users of HP2010, and has this changed since the 2005 User Assessment? What is the type, size, and location of the organization/agency? What population(s) does the organization/agency serve? What health priorities does the organization/agency support? Who is the target audience for the organization’s health promotion and disease prevention efforts? Which employees and/or departments within the organization/agency are involved in implementing disease prevention and health promotion programs? What are the characteristics of the organization/agency? 2. Are organizations aware Healthy People 2010, and if so, how are the organizations/agencies using the initiative? Has the use of Healthy People 2010 changed since the 2005 User Assessment? Is the organization/agency aware of Healthy People 2010? If so, how did they receive information about the initiative? Has the organization/agency incorporated the Healthy People 2010 initiative into its planning of health activities? If so, how did it do this? If using Healthy People 2010, is the organization/agency measuring changes in health behaviors or health outcomes in targeted populations? What resources have been most helpful in supporting the organization’s Healthy People 2010 activities? 3. What are the reasons that organizations/agencies are not using Healthy People 2010? What barriers to using Healthy People 2010 exist at the organization/agency? What aspects of the initiative pose obstacles or challenges to using Healthy People 2010 at the organization/agency? What changes to this initiative would increase its usefulness? What assistance could HHS provide to overcome barriers to organization/agency use? 4. What components of Healthy People 2010 are most useful to users? Do organizations/agencies use the overarching goals, objectives and indicators? If so, how frequently? Which of these elements are most useful to the organization/agency? What process does the organization/agency use to select priority objectives /indicators from Healthy People 2010? Does the organization/agency use Healthy People 2010 as a source of data for benchmarking or evaluation? 5. What elements would be useful in the final assessment of Healthy People 2010? Is the organization/agency intending to assess progress towards Healthy People 2010 goals? If so, how? To what extent should accomplishment of the objectives themselves be the standard by which the initiative’s success is measured? Should other factors be taken into account in judging the impact of HP2010, such as: enhanced capacity in states and localities; new partnerships among governmental and private sector organizations; or newly developed strategies for achieving the initiative’s overarching goals? 6. What key components should be considered in framing the next iteration of health promotion and disease prevention objectives for the nation? How can HHS improve the next iteration of national health objectives to be more useful to state/local/tribal organizations/agencies? To what extent are overarching goals a critical element of Healthy People? To what extent are focus areas a critical element of Healthy People? Should the next iteration of Healthy People contain more, fewer, or a similar number of objectives? Would a reorganization (e.g., by health risks/ determinants, by disease areas, by leading indicators) of objectives be helpful to state/local/tribal entities? How involved should states, localities, and tribes be in framing the next iteration of Healthy People? Chronic Disease Directors were included because they work within the state public health agency and may or may not be directly involved with Healthy People, but they are likely to be impacted by Healthy People goals. As another key stakeholder in the efforts to improve the health of the nation, the views of local health organizations were included as a separate sample. A list of 3,707 members of the National Association of County and City Health Officials (NACCHO) served as the sample frame for the local health organizations. The study also sought responses from two different types of tribal health organizations: individual tribal health organizations and Multi-Tribal Area Health Boards (MTAHB). Tribal health organizations provide health support to their individual tribe, while MTAHB advise in the development of positions on health policy, planning, and program design for a number of tribes in an area. While not every tribe is affiliated with a MTAHB, these organizations can be an important resource for implementation and outreach to the tribal health community. By including these two types of tribal health organizations, the 2008 User Study was able to more accurately capture the perspective of tribal health organizations and the unique ways in which they use Healthy People 2010. The final sample included 5172 respondents from the 50 states, the District of Columbia, Puerto Rico, the U.S. Virgin Islands, local health organizations, and tribal health organizations. The unit of analysis for the sample was the organization, meaning that no more than one survey was sent to each organization. The project took a census of HP Coordinators, Chronic Disease Directors, and MTAHB, and sampled local and tribal health organizations. A list of the 53 HP Coordinators and Chronic Disease Directors (including the District of Columbia, Puerto Rico, and the U.S. Virgin Islands) served as the primary contacts for the states. As noted above, NACCHO’s list of health officials served as the sample frame for the local health organizations, and the tribal health organizations were selected from a frame of 280 tribal health organization contacts provided by Indian Health Services (IHS). Finally, all12 MTAHB were selected from the list provided by IHS. The questionnaire was fielded from October 2008 until March 2009. Fielding the survey entailed mailing the questionnaire along with a cover letter to an identified staff member at each organization/agency. A self-addressed stamped envelope was included with each survey to facilitate the return of the questionnaire directly to NORC, the survey contractor. A follow-up letter was sent to non-respondents two weeks after the initial mailing, including information about completing the survey online; 26 percent of respondents completed the questionnaire online. Telephone prompting of those who had not responded began one month after the initial mailing. The telephone prompt also provided an opportunity to collect contact information for re-mailing or faxing questionnaires that had been lost or misplaced. Respondents were also given the option of completing the questionnaire over the telephone at that time; 5 percent of respondents completed the questionnaire over the telephone. Exhibit 3 indicates that for all sample types, mail was the most common mode of completion, followed by the web and then telephone. Based on the 2005 User Assessment, the data collection period was anticipated to end within four months of the initial mailing being sent. However it was determined that additional time was necessary due to slower than anticipated survey response. The original follow-up protocol established a limit of eight calls for non-respondents, after which the individual case was closed and removed from further follow-up. The maximum limit on call attempts was relaxed due to the unexpected difficulty in reaching respondents during the telephone prompting. Also, a review of call logs revealed that the cases that were being closed after eight follow-up attempts included a high proportion of respondents that appeared inclined to participate in the survey5. Thus, during the third month of data collection this limit was relaxed and non-response cases were closed on an individual basis (after 15-25 call attempts). This resulted in a longer (yet more successful) data collection period, ending five months after the initial mailing was sent. Appendix 2 includes summary information on methodological lessons learned, which may be useful should this study be repeated. 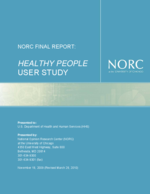 Following the data collection and analysis period, NORC lead 10 informal discussions with users and non-users of Healthy People 2010, from each of the sample types. These discussions provided an opportunity to gather more in-depth information on issues and themes that emerged during data analysis. The discussions resulted in the collection of qualitative data that provides specific examples supporting many of the study’s conclusions. To choose respondents for follow-up discussions, NORC carefully reviewed survey responses and selected a set of respondents whose uses, perceptions, and anticipated uses of Healthy People varied. Selected respondents were then sent an email providing information describing the purpose of the follow-up discussions. These emails were followed by calls to answer any additional questions and to schedule the discussion. The follow-up discussions were designed to be open-ended, each flowing differently depending on each respondent’s experiences and insights. An informal discussion guide was used to ensure the appropriate broad information was gathered in response to the issues and themes identified during data analysis. The informal discussion guide includes specific sections for Healthy People 2010 users and Healthy People 2010 non-users. A supplemental section was also developed specifically for MTAHB, to gather information on this new respondent type and how they interact with tribal health organizations. Finally, the informal discussion guide included a section on Healthy People 2020 to capture information on participation with the development of Healthy People 2020, as well as perceptions on how the initiative could be improved. The information discussion guide is included in Appendix 3. Of the 361 respondent organizations/agencies, 12 percent were HP Coordinators, 12 percent were Chronic Disease Directors, 2 percent were MTAHB, 14 percent were tribal health organizations, and 59 percent were local health organizations. The job titles of individuals completing the questionnaire at each organization varied. The highest percent of questionnaires (59 percent) was completed by Directors or Deputy Directors, while 13 percent were managers or supervisors, and 5 percent were clinic administrators/directors. Other individuals representing the organizations included: state health planners, epidemiologists, biostatisticians, policy analysts, bureau chiefs, health educators, district health officers and public health nurses. The set of respondent organizations/agencies appears diverse in many ways, including health care priorities, geographic locations, and size. Respondents were asked to indicate all of the health priority areas that their organization addresses. Exhibit 4 shows the health priority areas selected by over 75 percent of respondents, between 50 and 74 percent of respondents, and fewer than 50 percent of respondents. For example, over 75 percent of respondents indicated that disease prevention is a priority area for their health organization/agency. Disease prevention and public health preparedness are both areas that 85 percent of respondents selected as priorities. Exhibit 5 displays the distribution of respondent organizations according to Census region. Respondents from state health organizations, local health organizations, and tribal health organizations were organized into size categories based on the size of the population served by the organization/agency8. Each of the size categories was derived analytically using the distribution of the population served variable for each respondent type. Three categories (small, medium, and large) were set for each respondent group, with each of the categories making up roughly 33 percent of each respondent group. Exhibit 6 below identifies parameters for each groups’ size categories. Data analysis focused on identifying results of the key research questions. In addition to answering this core set of questions, the analysis compared the key respondent groups and determined the extent to which certain characteristics of the organization seem to be related to the level of awareness, the level of use, the nature of use, and the kinds of barriers experienced. All analyses were conducted using SAS version 9.1 software. The study questionnaire was designed to be both short and simple in order to encourage the participation of busy government officials. Many questions were limited to multiple choice items. This limited the number of possible answers and may not have fully captured the variety of uses of the initiative or the varying stages of integration of the initiative into existing programs. An exhaustive questionnaire would likely have resulted in a much lower response rate. A second limitation relates to the selection of the individual to be responsible for completing the questionnaire on behalf of the respondent organization/agency. The degree to which respondents were familiar with their organization/agency’s use of the initiative cannot be verified. Another limitation is the inability to generalize some of the tribal health organization results because of the limited number of respondents. For example, while 75 percent of MTAHB responded to the survey, the actual number of respondents was only 7. Finally, no follow-up was made with respondents to verify reported information or retrieve missing data.